Got Your Backpacks? Fill Those Blue Barrels! You may have noticed a familiar sight at Methodist locations across the metro area. That's because it's time once again to fill the blue barrels with school supplies for the KETV 7 Can Help Kids/Salvation Army Back-to-School Backpack Program. Methodist Health System is a proud sponsor of the annual event. Last year, nearly 13,400 backpacks were distributed to local kids in need to start the school year. For some in our community, providing the necessary school supplies kids need to succeed can be difficult, which is why we need your help. 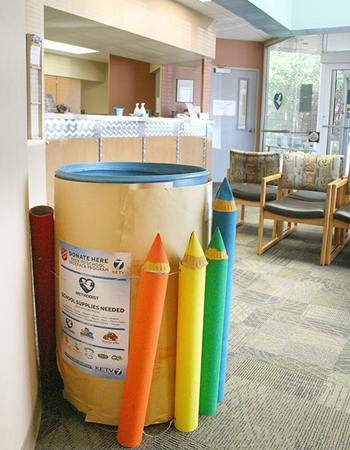 Barrels to drop off backpacks and school supplies are out now at metro area Methodist Physicians Clinic locations, as well as Methodist Hospital, Methodist Estabrook Cancer Center, Methodist Women’s Hospital and Methodist Jennie Edmundson Hospital. Visitors are welcome to utilize the Methodist Hospital valet service to do a “drive-through donation drop-off” at any time. Barrels will be available from July 2 through Aug. 8. This program is only successful with your help! Help Methodist, KETV and the Salvation Army reach their goal of helping area children have a strong start to the school year!